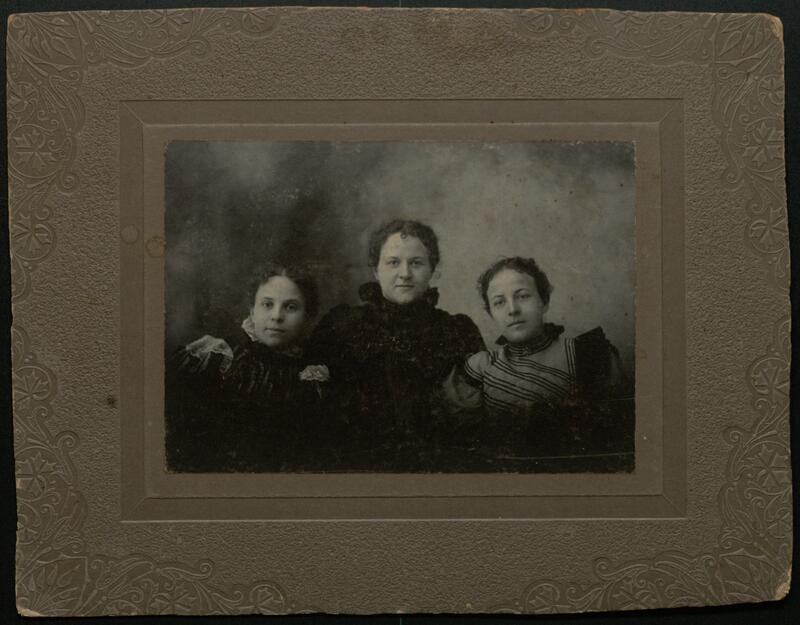 Description: A photograph of sisters Rosa Lee, Sarah "Sadie", and Novaline George Baldwin. Rosa Lee was born to the parents of George Baldwin and Novaline Molton James Baldwin in 1866 in St. Louis. She graduated from Norvilla Collegiate Institute in Louisiana in 1884 and spent several years as a teacher. She married Reverend George G. Woodbridge on August 27, 1890, and had two children with him, Novaline and Samuel. She died in Louisiana on July 22, 1907. Sarah "Sadie" Baldwin Bettis was born to Novaline and her husband, George, on September 23, 1871. She married a Frank Jewel Bettis on August 27, 1890, in Orange, Texas. They moved to Beaumont in 1893 where she was active in the Daughters of the American Revolution and the Colonial Dames of America. She died at the age of 80 and is buried in Magnolia Cemetery. Novaline George Baldwin was born on February 2, 1874, in St. Louis. She graduated from Norvilla Collegiate Institute. On June 25, 1897, she married a Charles Henry Stroeck. Together, they had one daughter named Rosa Lee. Novaline was active in her community and served as president of the board of the YMCA, a member of the Colonial Dames of America, the Daughters of the American Revolution, and the United Daughters of the Confederacy.